Rahul Yadav’s much vaunted startup is finally beginning to take shape. After being fired from the Housing CEO post, Yadav had taken to social media and announced that his startup would be “10x more than all Indian internet companies put together”. He’d then gone on to tantalizingly reveal bits and pieces about the details of his new venture. It had emerged then that the company would be in the data analytics space and would be called Intellignent Interfaces. More details have now surfaced about his company. “The startup will be an interface that will be used by government officials,” Yadav told Economic Times. “I see very large businesses that can be created in partnerships with government,” he said. Yadav, who’d attempted to streamline the rental agreement process while at Housing, cited this as an example of the kind of processes his startup would look to optimize. A simple move like this had the potential to save the government Rs. 2000-3000 crore, he claimed. And Yadav’s found big backers for his bold plans. The investors in Intelligent Interfaces read like the who’s who of the Indian startup ecosysten. 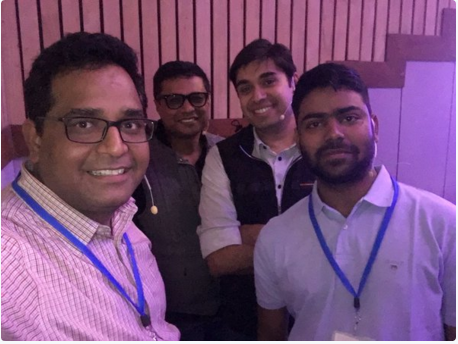 Flipkart cofounders Sachin Bansal and Binny Bansal have confimed their investment in the compnay, although they declined to reveal the amount. “He is doing something which is good for the country,” Sachin Bansal said about the startup. Yadav is also backed by Flipkart’s rival Paytm’s cofounder Vijay Shekhar Sharma. “He (Yadav) is definitely an incredible maverick. He has an understanding of technology and we hope he has learnt his lesson (at Housing) and moved ahead.”, he said.